I have been under the weather for the last few days fighting a killer cold. I hate it when I am stuck in bed. I mean you can only watch so much food tv and Lifetime movies without feeling like you are going to lose your mind! I finally felt well enough to get up and cook last night and of course the one thing I wanted to make was a nice big bowl of soup. 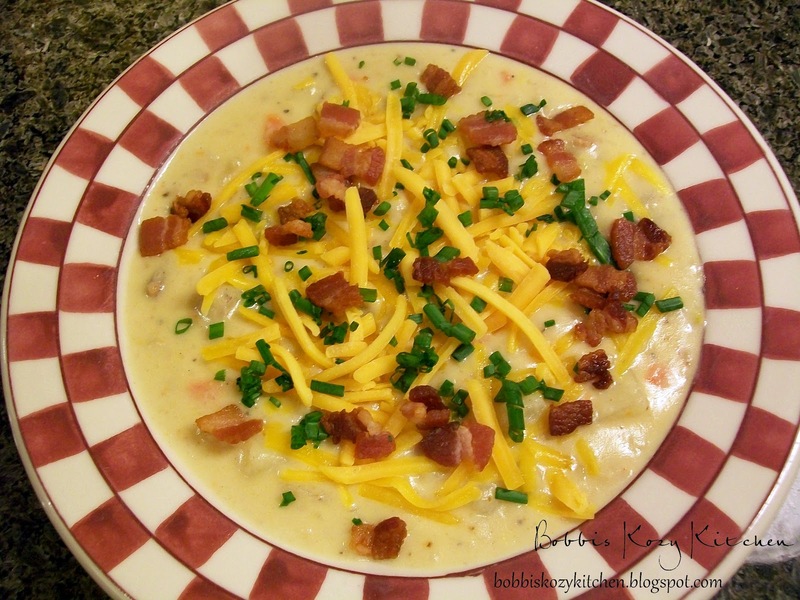 A while back I found a recipe for the loaded potato soup they serve at the Carnation Cafe in Disney World. It sounded wonderful but called for a whole quart of heavy whipping cream!! Oh my clogged arteries!! I knew I needed to lighten it up a bit so I switched out some chicken stock for some of the whipping cream and half and half for the rest. Still not the healthiest it could be I guess, but I felt much better about eating this version. Not meaning to take anything away from the original recipe. I am sure it is amazing! There is also another bonus to this recipe besides it being lightened up a bit. There is a fabulous, and I mean FABULOUS, giveaway going on over at Tidy Mom so “Come join SoupaPalooza at TidyMom and Dine and Dish sponsored by KitchenAid,Red Star Yeast and Le Creuset”. In the bacon fat cook the onions, celery, and carrots until the onions are translucent. about 5 to 7 minutes. Add potatoes and cook for 4 minutes, stirring occasionally. Last week was Kevin’s daughter’s 18th birthday. Ever since my kids were young they knew that on their birthday they got to request anything they wanted for dinner. What is funny (or somewhat annoying) is that with all of the meals I cook and the variety of food I work with doesn’t seem to matter to them. You would think they would request something extravagant or gourmet. Nope, not my kids, you know what they request more often than not? Chili Mac! Yup good old chili with some mac and cheese thrown in. They can’t get enough of it! When they were little, before I started this culinary voyage of mine, I would actually make a box of mac and cheese and throw in a can of chili and BOOM that was dinner. Once I started experimenting and trying to make things healthier I decided to change it up by making my own cheese sauce and chili. Ummm that was a mistake. They took one look at it and asked me what it was. I told them it was what they had requested. Their reply? No it’s not. *sigh* I give up!! So you can imagine my surprise when I asked Dakota what she wanted for her birthday dinner and her reply was “I don’t know, something with broccoli in it”. WOW you mean I actually get to cook something? Her only other request was no mushrooms. OK, I can work with that. So I set my mind to work thinking of what she might enjoy. I though about making my Chicken Divan but was afraid it wouldn’t be enough for everyone. Then I remembered she liked Italian food. Hhhmmm something with pasta. I already had chicken and broccoli on the brain so it seemed a logical choice to add my garlic Alfredo sauce to it and put it over some fettuccine. The original Alfredo recipe I came up with included mushrooms so of course I omitted those. I also doubled the sauce recipe because I was making a whole pound of pasta and the last time I made it I used it as a sauce to just cover my Chicken Lasagna Roll Ups. I was a bit nervous because I rarely get to cook for her. She doesn’t live with us, so pretty much the only time I get to cook for her is at the holidays. I really wanted her meal to be something special and memorable. I guess I was silly to worry because she, along with the rest of us, loved this dish! I would suggest a small side salad to go along with it but that wasn’t on the requested menu plan so we had some garlic bread on the side. This recipe is super simple and full of flavor. I hope you will give it a try. Maybe for a special family meal? In a large pot heat water to boil, add salt and the pasta and cook per package directions. Drain pasta and reserve in pot. In a large skillet heat 2 tablespoons of olive oil over medium heat. Season chicken breasts generously with salt and pepper and add them to the skillet cooking for about 14 minutes (7 minutes per side). Remove the chicken breasts and set them aside to rest. Once cool slice the chicken breasts in thin slices. Add the last tablespoon of olive oil to the skillet you cooked the chicken in and raise the heat to medium-high. Add the garlic and cook for 1 to 2 minutes. 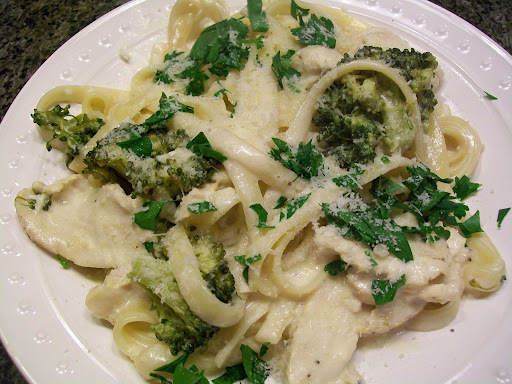 Add the butter and once it melts add the heavy cream, Parmesan cheese, broccoli, and nutmeg. Stir to combine and pepper to taste. Simmer until thickened, 3 to 5 minutes. Add the chicken to the sauce and cook just long enough to heat the chicken through. Remove from heat and pour the sauce over the pasta. Stir to combine. 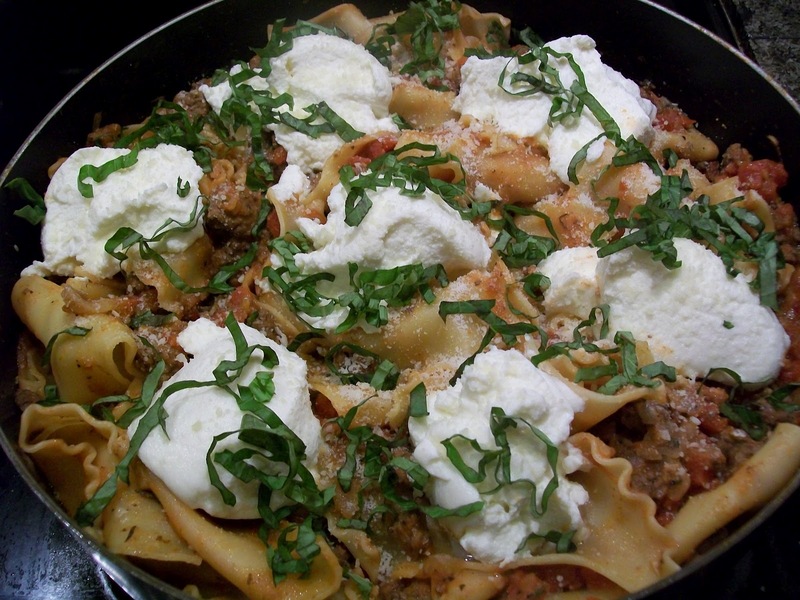 Serve topped with chopped parsley and extra Parmesan cheese if desired. 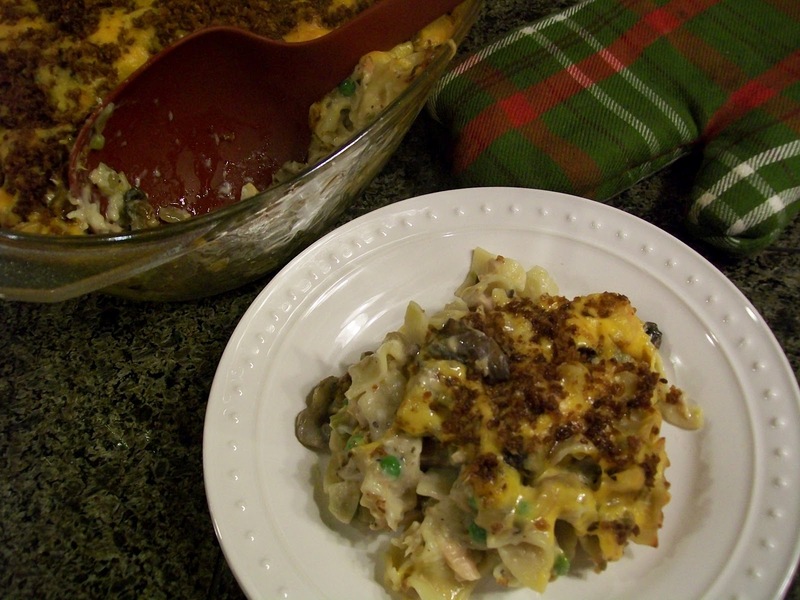 This casserole has seriously become one of my favorite casseroles of all time. It is inexpensive (hello, canned tuna) and sooooo very tasty! It came from my desire to revamp some of the recipes from my childhood. Everyone’s Mom used Cream of Mushroom soup for just about every casserole they made right? You know I have an issue with that just because you lose control of the sodium and fat content of your dish. No I am not a control freak, OK well maybe just a little, but mostly I don’t like hidden anything in my meals. By using fresh mushrooms and making a bechamel sauce you have a “cream of mushroom” feel but it is so much healthier. The other thing I love about this recipe is you can pretty much throw any veggies at it you like. Have some leftover broccoli or red bell pepper? Go for it! Artichoke hearts would be awesome in this as well. You can also change up the cheese you use. Also, I used panko bread crumbs for the topping of mine but I know many people use crushed up potato chips. I read a little blurb in one of my food magazines about using salt and vinegar chips on top. I didn’t do it but it sure sounds good! Other great things about this recipe, you can make this ahead and keep it in the fridge until the night you want to make it. Take it out to warm up at room temp while you are preheating your oven, pop it in and away you go. The only thing I would change if you make it ahead is do your bread crumbs the night you bake the casserole so they stay nice and crunchy. Also this reheats wonderfully and tastes just as good the next day! Preheat oven to 375 degrees F. Spray a casserole dish with non stick spray. Bring a large pot of water to a boil, add salt and the noodles. Cook as package directs for al dente. Drain and return the noodles to the pot. 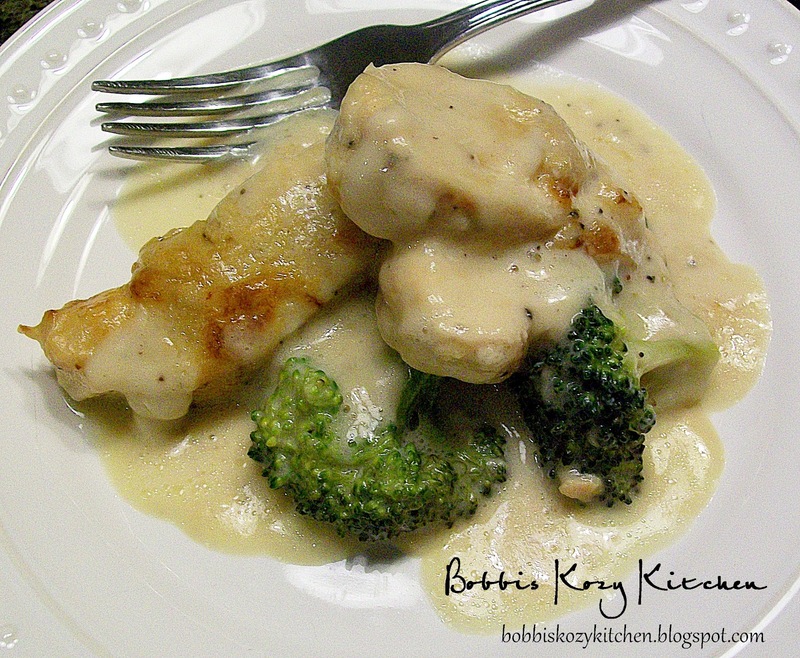 In a small sauce pan or skillet, melt 2 tablespoons of butter. Add the bread crumbs and cook just till they begin to brown. Remove from heat. Sprinkle the buttered bread crumbs over the top of the casserole. Bake for 25 minutes, until lightly browned and bubbly. I am always on the look out for healthy alternatives for classic dishes. When it comes to mashed potatoes I think I could eat them every night of my life. I must take after my Father with that love because that man could make a meal out of JUST mashed potatoes and be happy as a clam to do it! I had heard, from many people, that mashed cauliflower could easily be substituted for mashed potatoes and it would be the same thing. Ummmm, after trying it with many different flavorings added, I have to say I deeply disagree (as did the whole family). I am not saying it was bad, it just wasn’t what we were looking for. We actually aren’t big cauliflower lovers here (I love it raw) but we are all open to try new recipes and to try to find the healthier alternatives. OK maybe I am always open to that and they are my captive audience. But whatever works right? That was when I thought about trying this recipe. 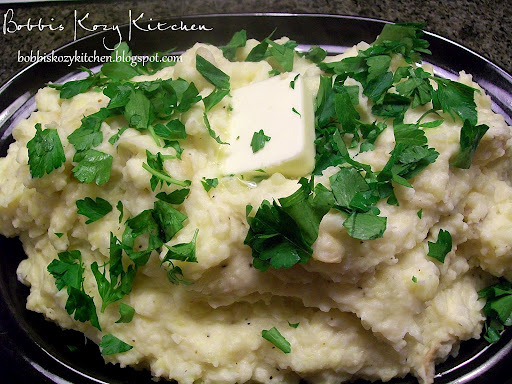 I have a mashed potato recipe that is hands down my families favorite. My Roasted Garlic Mashed Potatoes are so tasty but I wanted to lighten them up. If you are not a lover of cauliflower I really think you will be surprised by this recipe. If you are, you will love it as well. Either way it is a great way to sneak cauliflower in on your kids if they are picky eaters. You can make mashed potatoes for them and feel good about it too! While you are waiting for the garlic to cool place potatoes and cauliflower in a large saucepan, add enough cold water just to cover them. Bring to a boil over high heat and cook until tender, about 15 minutes, Drain well. While the potatoes are cooking, combine the milk, garlic paste and butter in a small saucepan and bring to a simmer over low heat. Stir the milk mixture into the potatoes until combined. Fold in the sour cream and season well with salt and pepper, top with chopped parsley and a dab of butter and serve. Hope you all are having a wonderful Wednesday. This morning, for whatever reason, I woke up thinking it was Tuesday. I somehow totally missed a day! But I am on the right track now. Hopefully I can remember the recipe!! I am just kidding. Food is the ONE thing I ALWAYS remember! I decided I wanted to do a lasagna but had been requested to try and do a lasagna that doesn’t cost a huge amount. I am sure you know that making a traditional lasagna can get quite pricey. I kept my cost much lower by doing a stove top skillet version. The only thing I do suggest you splurge on is the name brand ricotta cheese. I have tried this recipe with both name brand and store brand. The taste does not compare. Also make sure to salt and pepper to taste at each step. This is a great week night meal. I told Kevin it was kind of a fancified hamburger helper but he assured me that there is no hamburger helper in the world that tastes as good as this. You could always change it up and use mild or hot Italian sausage (beef or turkey) but again in trying to keep the cost down, I used ground beef since it was on sale. Pour the diced tomatoes, along with their juice, into a quart measuring cup. Add enough water to equal an even quart. Heat olive oil in a large nonstick skillet (with a lid) over medium heat. Add onion and cook until translucent, about 5 to 8 minutes. Stir in garlic and red pepper flakes and cook for an additional 1 to 2 minutes. Add ground beef and cook until no pink remains. Use a wooden spoon to break the ground beef into small bits. Salt and pepper to taste. Scatter the broken noodles across the beef mixture.Pour diced tomatoes and tomato sauce over the noodles. Do not stir. Bring the skillet to a boil and then cover and reduce heat to a simmer. Cook until the pasta noodles are done, about 20 minutes, stirring occasionally. Remove the skillet from the heat and stir in the Parmesan cheese. Salt and pepper to taste. Dot with heaping tablespoons of ricotta cheese. Cover with lid and allow to sit for 5 minutes. Uncover and sprinkle with Parmesan cheese and basil. Serve with a green salad side. I didn’t put this in as a Bobbi on a Budget recipe just because some people don’t have cooking sherry readily available. However, you can usually pick up a bottle for about $5.00 and it is a great thing to have around for recipes. It will last you forever. I keep sherry, white vermouth, Marsala wine, and white wine around just for cooking. But if you want a substitute for the sherry and don’t have any of the above (or prefer a non alcoholic ingredient) you can use some apple cider vinegar. It will give it a different flavor profile but will give it a bit of that bite that the sherry gives it. Just taste it and adjust according to your preference. Other things in the recipe, like Parmesan cheese, are always in my fridge or pantry as well. The consensus on this recipe was that it was a keeper. There were plenty of oohhh’s and aahhhh’s and OhhEmmGeee’s. The sounds that make a food blogger very happy! Season chicken with salt and pepper. Heat oil in a large skillet over medium heat. Add chicken and cook, turning once, until golden brown and just cooked through, 13–15 minutes. Transfer chicken to a plate; let cool slightly. Cut chicken lengthwise on the bias into 1⁄4″-thick slices and set aside. So I have given my marathon of Mexican food recipes a rest but took a trip back to my soup obsession. Truthfully I had not been planning on making any soup. The weather here has been pleasantly mild with ZERO rain (What no rain in Washington??? ), so I wasn’t craving soup at all. Then I walked into the grocery store and saw a beautiful sight. Bundles of asparagus. Not the big thick ones that have been the norm, but nice thin tender ones. I was such a happy camper!! Asparagus is, hands down, my favorite vegetable, and the majority of the household feels the same. What was even better was that it was on SALE. Yessssssssssss!!! I grabbed two and finished up my shopping. Once I got my little green bundles of joy home I started thinking about what I wanted to do with them. I didn’t want to use them as a side because I was so happy to find them I didn’t want them to take a back seat to anything. I thought about working them into a chicken main dish I have been working on but then it hit me….how do I let those babies shine? Put them center stage! BING the light bulb goes off in my head…..SOUP? Yes!!! I have made many soups but never an asparagus soup. I have no idea why since it IS my favorite veggie. I was also planning on making grilled ham and Swiss cheese sandwiches to go along with this soup. Sounds yummy right? Well it WOULD have been but the kids ate all but three pieces of the ham so I had to scratch that. It turned out fine though. This soup was such a star I didn’t want anything else!! I also got to use my new immersion blender with this recipe so that was an extra bonus. Don’t worry, if you don’t have an immersion blender a regular blender works just as well. This picture doesn’t show the green of the soup very well. I sooooo need a new camera!!! Melt butter in a large soup pot or dutch oven over medium-high heat. Add onion and garlic, and saute 5 minutes. Season with salt and pepper. Add asparagus and saute another 4 minutes. Add the white wine and let it cook for about a minute then add chicken stock and bring to a boil. Reduce to simmer and cook for 30 minutes, until asparagus is very tender. 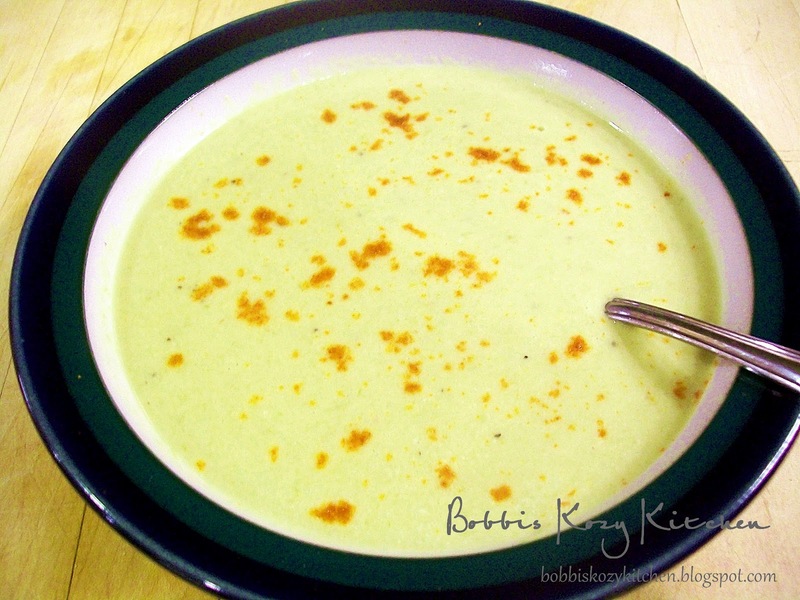 Using an immersion blender, blend the soup until smooth or *Carefully transfer to a blender and puree until smooth. Return to the soup to the pan, stir in sour cream and season with salt and pepper, to taste. Transfer to serving bowls. Dust with cayenne pepper and serve. As promised here is the second part of yesterday’s recipe. Once you have made the Puffy Chicken Tacos you will have a wonderfully flavorful broth left that just begs to be a soup, and there could not be an easier one than this one!! After you put all the work into the tacos this is a nice easy follow up. Oops, back to the soup…you only need a few ingredients for this. But it is so full of flavor you will want to eat the whole pot!! I was so excited to try my hand at making these tacos. They looked so crunchy and yummy when I saw them at the restaurant that I just wanted to run home and get into my kitchen! Do you ever do that? I am sure I drive my family crazy with it. We will order a meal and when it comes to the table I of course have to talk about how the food looks, then how it tastes, then how I can figure out what is in it and recreate it at home. They all look at me like “Really? Can we please just eat our food?” *sigh* the hazards of living with a food blogger I guess. So this was one of those moments. Although they weren’t complaining when I made it….HA!! I will have to admit, I struggled with the tortillas. I don’t know if the dough was too moist or too dry but I just couldn’t get it to stay together. So I had to use my back up plan and fry regular white corn tortillas until they were puffy. They were great but I will conquer the elusive homemade puffy corn tortilla, I swear!! In case you posses better tortilla skills than me, I will post the recipe for how to make the tortillas below. The other thing I like about this recipe is that I made two dishes using ingredients from this one recipe PLUS I used my Roasted Tomato Salsa Roja. 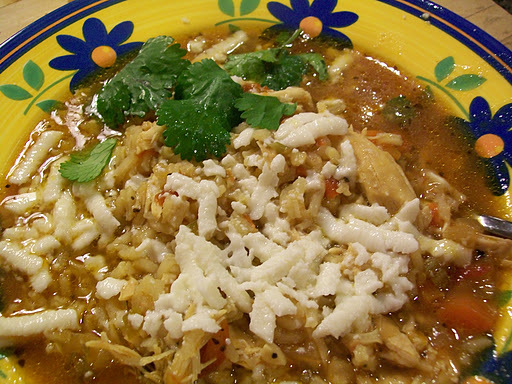 I will be posting the recipe for my Mexican Chicken and Rice Soup tomorrow so make sure and hang on to the broth that you cook your chicken in tonight!! Heat oil in an 8-qt. saucepan over medium-high heat. Season chicken with salt and pepper, and add to pan, skin side down; cook, turning once, until browned on both sides, about 8 minutes. Transfer chicken to a plate; set aside. Add garlic, onion, celery, carrot, and bell pepper; cook, stirring, until soft, about 20 minutes. Add stock and tomatoes, and return chicken to pan; bring to a boil. Reduce heat to medium-low; cook until chicken is very tender, about 1½ hours. Remove chicken from sauce, and let cool (Make sure to reserve sauce for Mexican Chicken and Rice Soup). Discard skin and bones, and shred chicken; set aside. Meanwhile, combine avocados, garlic, lime juice, and salt and pepper in a bowl; chill guacamole until ready to use, covering to avoid browning. Pour oil to a depth of 2″ in a 6-qt. Dutch oven and heat over medium-high heat until a deep-fry thermometer reads 375°. Stir together masa, butter, and 2¼ cups warm water in a bowl until dough forms; divide dough into 12 pieces and shape each piece into a ball. Using a tortilla press or rolling pin, flatten each ball into a 6½″ disk. Place 1 disk in oil. When it begins to puff, press the end of a metal spatula into the middle of the tortilla so that tortilla bends into a taco shape; hold spatula within tortilla until taco is golden brown and crisp, about 1½ minutes. Transfer taco to paper towels to drain; repeat with remaining tortillas. 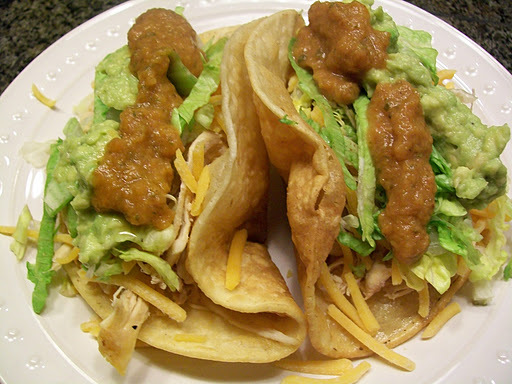 Divide chicken and guacamole among tacos; top with lettuce, tomato, and cheese. Carne Guisada is a very popular dish in Texas. It is a Tex-Mex favorite. It actually translates into “stewed meat”. The most popular meat used is beef and YAY that was what I had to work with. There are many options with this recipe. You could really do like I did and make it however you want to with the different variations out there. Some use potato, some no tomatoes. It is just like a regular beef stew, all up to the taste of the person preparing the meal. You can use whatever peppers you want in this recipe. I used 1 poblano, 1 Anaheim, and 2 Fresno’s. But you could use any mix you like, from Serrano to sweet bell peppers, depending on the heat level you want. With the mix I used there was a nice heat but not TOO hot. Especially after you add the masa paste. We actually discussed making it spicier next time to please the pepper lovers in this house. This would even make a great Super Bowl meal. 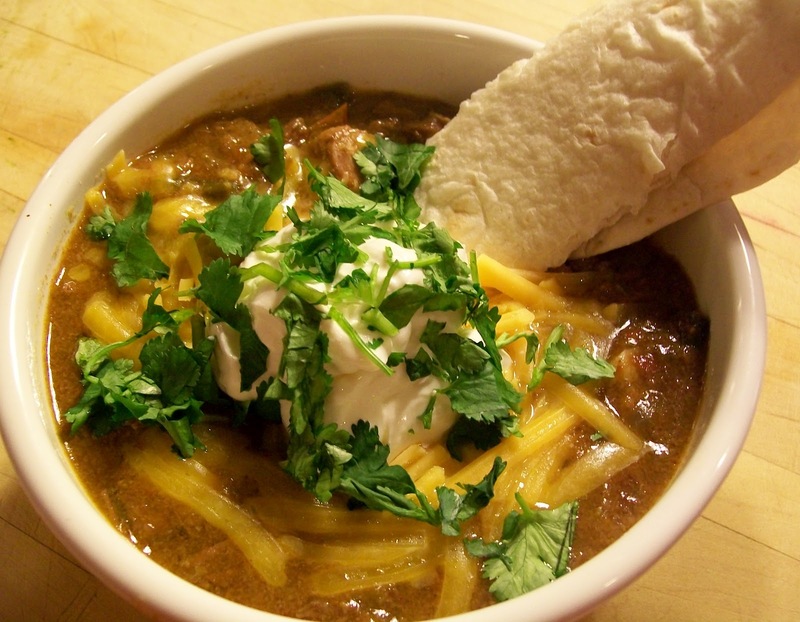 Rev up your slow cooker and by it is time to eat you have a nice hearty healthy stew. Of course I topped mine with sour cream and used tortillas to dip, but even with that it really isn’t too far off the “healthy” path and we ALL love slow cooker recipes right? Heat the olive oil in a dutch oven over medium-high heat. In a bowl add the flour, salt, and pepper, combine and dredge the beef in the flour. Shake off the excess flour and brown the pieces in the dutch oven. Once brown place into the slow cooker. Add the peppers, onion, garlic, cumin, oregano, chili powder, salt and pepper to taste. Add the canned tomatoes, with their liquid, to the slow cooker and break the tomatoes up with your fingers (I give them a squeeze but, make sure you aren’t wearing a shirt you don’t want messy). Add your beef stock just until the meat is covered. If you need more you can add water.